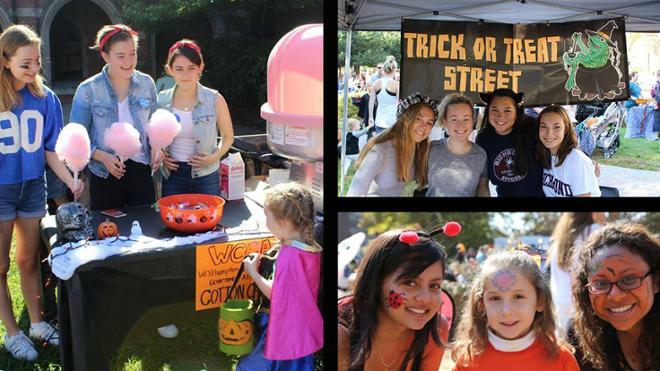 The annual ‘Trick or Treat Street’ event celebrates its 20th anniversary at University of Richmond on Sunday, Oct. 21, from 11 a.m. to 3 p.m. Children from the community can safely trick or treat at UR’s Stern Plaza between Ryland Hall and Jepson Hall. Almost 50 student organizations will have activity tables set up across the plaza. There will also be food trucks on campus and of course, lots of candy. “The executive team is so excited to be celebrating the 20th year of a beloved campus tradition! Community members and students can look forward to a full day of familiar activities and some new surprises,” said Sadie Roulston, president of Trick or Treat Street. All proceeds from the student-led service event will go directly to the Ronald McDonald House Charities of Richmond. It is requested that families bring a $10 donation. “We have some tricks up our sleeves. It would be a real treat if you all join us," said David Turley, vice president of Trick or Treat Street. Parking can be found following signs around campus to the C-Pines lots behind Ryland Hall.